With less than 5 percent of the world’s population and 7 percent of its land area, the United States consumes nearly one-third of the world’s non-energy materials. There are some 30,000 chemicals on the US market; less than one quarter have been adequately tested for human health and environmental effects. The US economy is neither safe nor sustainable. to managing chemicals and materials. Resources for promoting more sustainable chemical and material policies. 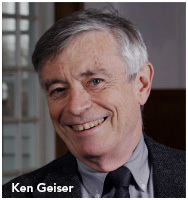 Compiled by Ken Geiser, Professor Emeritus of Work Environment, University of Massachusetts Lowell where he served as the founding Director of the Massachusetts Toxics Use Reduction Institute, Director of the Center for Environmentally Appropriate Materials, and Co-Director of the Lowell Center for Sustainable Production.